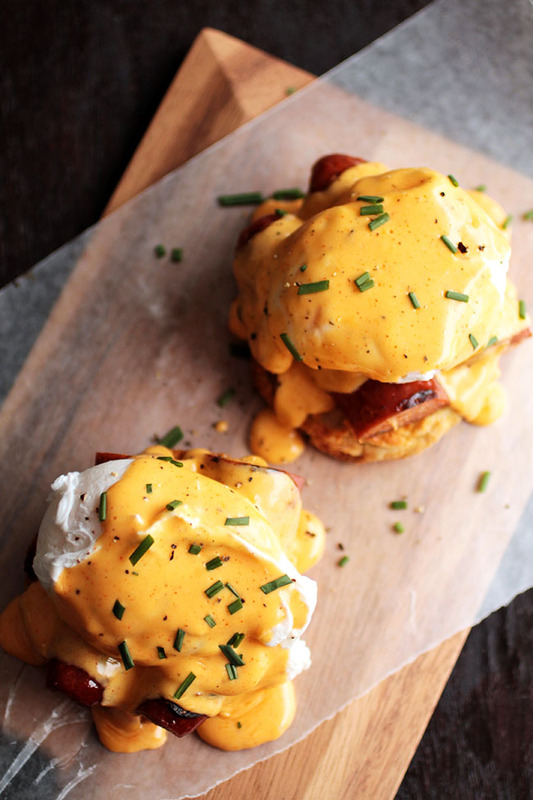 Put a spin on classic brunch recipe with this Cajun Eggs Benedict! 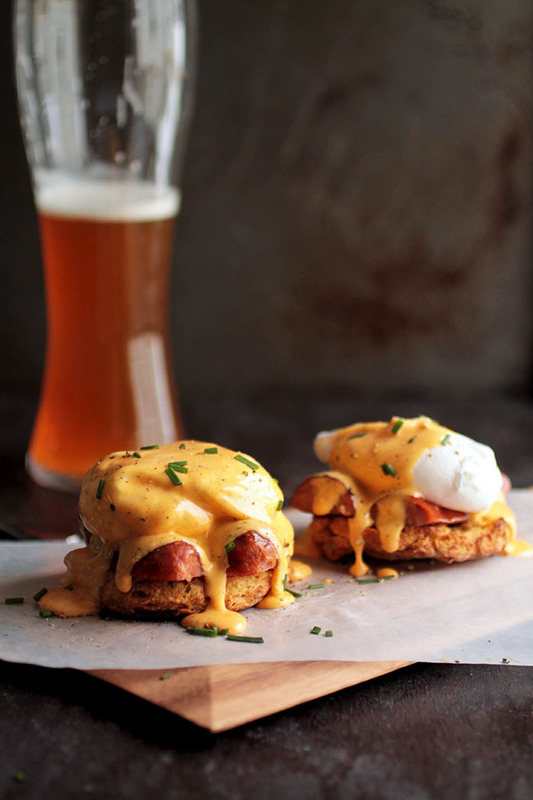 Soft cheddar beer biscuits topped with andouille sausage, poached eggs, and a spicy homemade hollandaise sauce. I’ve got New Orleans on my mind. It’s not just the sunshine and the food (THE FOOD OMG) and the great music around every corner. While I count down the days until our next trip to the Big Easy, I keep myself busy by bringing a bit of NOLA-inspired flavor to my kitchen in the form of this Cajun Eggs Benedict. You may know I’ve been a little obsessed with putting eggs on top of everything lately. 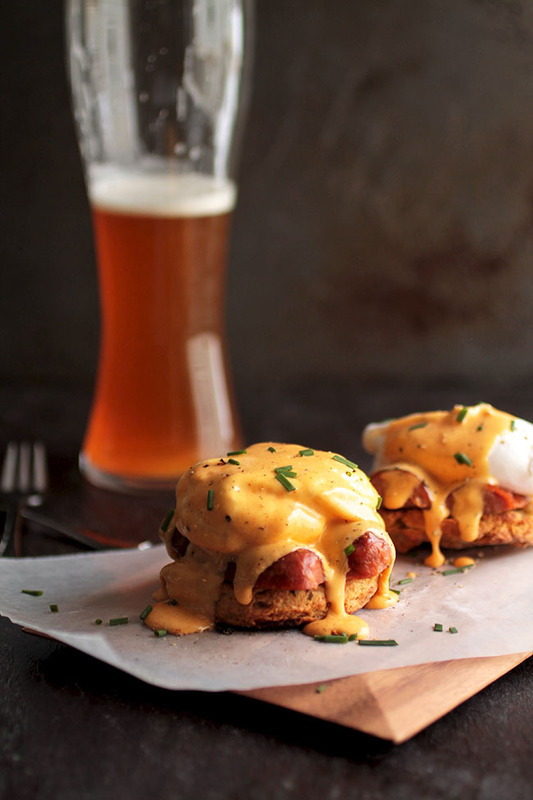 Combine that with a strong urge for these Chive and Cheddar Beer Biscuits, some Andouille sausage in my fridge, and my 24/7 New Orleans trip planning, and the obvious choice is to make a Cajun-inspired Eggs Benedict. This recipe is deceptively simple, folks – don’t ever let people tell you that homemade eggs benny is difficult or too hard to make, because those people are liars. I make hollandaise with my immersion blender and I love love love it. I get a perfect hollandaise every time, no whisking required. (Side note: have you ever actually tried to whisk hollandaise by hand? It takes way too many dishes and way too much attention and has way less immersion blender-ing. I’ll take my lazy version, thank-you-very-much). 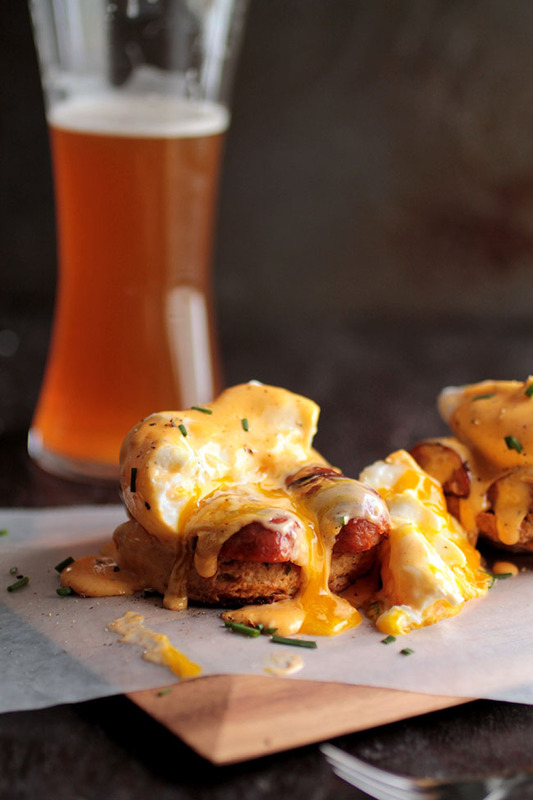 This particular hollandaise gets a bit of a kick from some paprika and cayenne pepper, but the real spice comes from a sizzling andouille sausage snuggled up between a toasted Chive and Cheddar Beer Biscuit (best decision ever. EVER.) and an excessive a perfectly appropriate amount of buttery, rich, slightly spicy hollandaise. 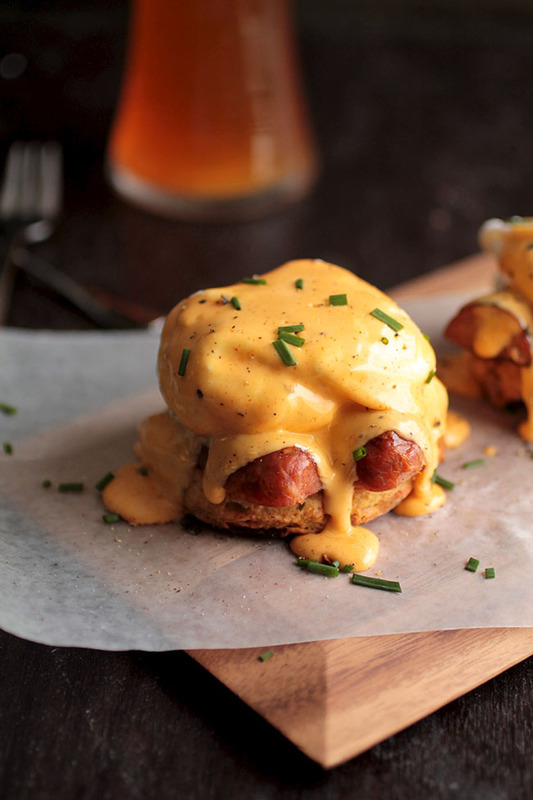 Basically, this Cajun Eggs Benedict needs to be your new best breakfast friend. 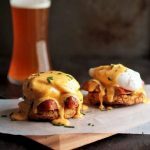 An easy cajun eggs benedict brunch recipe. Melt butter in a saucepan (or in the microwave!) until a thermometer registers the butter temperature at at least 200 degrees F.
Side note: you could also make this hollandaise in a regular blender if you don’t have an immersion blender. I just like the ease of the immersion blender! Heat sausages through in the oven or on a grill pan until they’re sizzling hot. It took about 5 minutes on a hot grill pan for my andouille to get nice and toasty. Slice each sausage in half lengthwise and then slice each half again across the middle so you have biscuit-sized sausage pieces. Assemble! Place two sausage pieces cut-side down on top of each biscuit half. Top each biscuit with a poached egg, followed by a sprinkle of salt and pepper (always season your eggs!) and a generous drizzle of hollandaise sauce. Top with chopped chives to garnish and serve immediately. You can make the hollandaise in a regular blender if you don’t have an immersion blender (or just don’t want to use it). I just like the immersion blender because it’s quick and easy with not much cleanup! I love this immersion blender from Cuisinart. For more handy immersion blender tricks, check out this post! Lately I’ve been adding a splash of white vinegar to the water before I poach eggs – I never used to, but lately I think it’s been helping them come out a little prettier. Water should be just barely simmering for best poaching results! For best results, I crack each egg into a ramekin, then gently tip the egg into the hot water and let it do its thing. Play around with different techniques to find out what works for you! 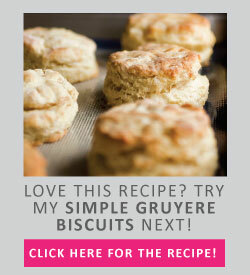 Use English muffins or plain leftover buttermilk biscuits in place of the cheddar beer biscuits if you like. Use chorizo in place of the andouille if you like. Top eggs benedict with avocado slices, microgreens, arugula, or grilled bell peppers and onions to make this a little heartier. I must try this. We were in New Orleans 3 weeks ago and had this. My husband is still talking about it!!! I thought the sauce had cheese in it. Will try it soon. I added a bit of Sriracha to the hollandaise for more spice, otherwise it it my favorite eggs Benedict after red chile eggs Benedict. As a side note, it’s always New Orleans, never NOLA. 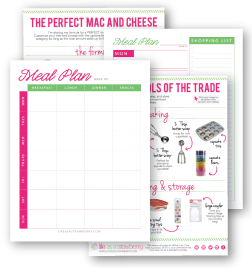 Love the Sriracha idea! Thanks for letting me know you like it. NOLA works! So does Nawlins or New Orleans, whatever you prefer, just visit often & leave lots of money! Extremly nice recipe! Made the Hollandaise with a bit of white wine, but still a great succes! Good luck with your substainable seafood conference! I’m so glad you liked it! White wine in the hollandaise sounds great – I’ll have to try that next time. Thanks for letting me know how it turned out! I would love to go to Commander’s Restaurant! Read about it and put it on my bucket list!! Y’all talking about Commanders Palace?! I have always wanted to visit NOLA but have not made it yet. I would like to go to any place that serves food. I so wish I could go this year to SSBP conference! But I will most likely be moving to a new state with my fiance right at that time in June. Bad timing. . . Hopefully I can go next year. I really wanted to go to New Orleans too!